Growing garlic is one of my favorite gardens delights. There is nothing like the taste of fresh garlic from the garden; once you have it you’ll never what the stuff from the store. Here in Phoenix I start putting garlic in the garden in late September, so it is just about that time. 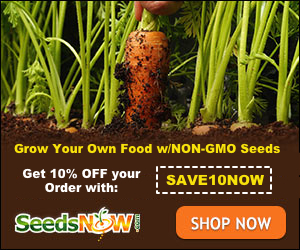 If I’m Growing Garlic, do I Need Garlic Seeds? Not exactly, when growing garlic you’ll need garlic bulbs. I recommend you buy bulbs specifically for planting. You can grow garlic from the grocery store but you’ll have a harder time. Grocery store garlic is usually treated so it will not sprout. Not to mention you’ll miss out on the wonderful varieties of heirloom garlic! To purchase your garlic I recommend Seeds Now or Baker Rare Seeds; both have many different types to choose from. The Softneck Variety – This garlic will have a softer neck (stem) after harvesting and will be easier for braiding. These are great for warm climates and what I plant here in Phoenix. I have also found that the softneck garlic has a stronger flavor than the harneck types. The Hardnek Variety – The hardneck garlics will grow best in colder climates and usually don’t store as well or as long as the softnecks will. Check the best time to plant garlic in your zone (check your zone here). In cooler climates you may be able to start your bulbs in spring but most of us will plant in the fall. You’ll want a light and fertile soil with plenty of drainage. I have used my DIY Soil Mix with great results! I grow garlic all over my raised beds because the keep many pests away. Garlic prefers sun so don’t choose a shady spot in your garden for growing garlic. To plant you’ll want to separate your head into individual cloves if they are not already like that. Check that your cloves or bulbs are blemish free before planting. Plant each clove 2 inches deep with the pointy end up. You’ll want to give your bulbs about 4 inches distance from the next. If your climate tends to freeze you’ll want to give your garlic a mulch cover and remove as the temps rise. You should see shoot popping up in 4 – 6 weeks. While garlic is fairly easy to grow you’ll need to monitor your watering. Garlic prefers even moisture. Too much water and you’ll have poor quality wrappers, skins and even mold. Too little water will keep your heads from reaching their full potential. Watering every 3 to 5 days should be adequate. In less than 4 weeks you should start seeing shoots popping up through the ground. Watch for flowering and trim off flowers if they develop; these could cause smaller bulbs. Don’t rush it! Your garlic will take 5 – 7 growing months before it is ready to harvest. But it is worth the wait! Once you see that most or all the garlic greens have turned brown, your garlic is ready to harvest. Make sure you give the garlic time to dry out below ground before pulling it out. Don’t water for a couple days before pulling the plants. You will gently pull the plants by hand or use a small garden shovel to assist. Lightly brush off the outside dirt and allow your garlic to cure in the shade with plenty of air circulation. You’ll know they’re ready for storage with the outside is dry and paper like. Remove the dirt and dirty “papers” from the outside of the bulb but DO NOT remove all the outer papers! Store at room temperature and your garlic will last up to 8 months. You can freeze or pickle garlic as well. Don’t forget to save some for homemade garlic powder! You can braid the softneck garlic or trim the roots and leaves and store them individually. Don’t forget that garlic also has wonderful medicinal properties. 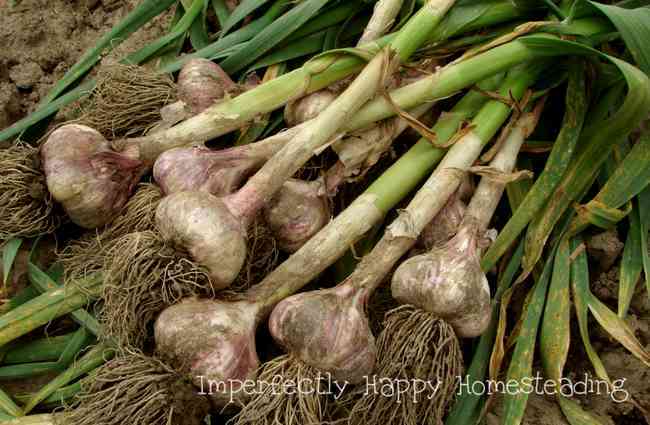 I use fresh garlic to make a natural cough syrup. We love our home grown garlic here. We plant now in the fall and will harvest it next spring in early June. It’s one of the easiest things to grow in my opinion because it is fairly maintenance free. Then once you harvest, just let it dry out naturally. Great stuff! You should correct this “separate your cloves into individual heads” to “separate the heads into individual cloves”. I’ve met several people who didn’t understand this and planted the whole head! Here in Upstate NY, I cover our garlic with about 4″ of straw and leave it on until I harvest. Also, when it sends up the flower stalk you want to trim this off. It is called the “scape” and if left on will impact the growing of the garlic head. You can use the scapes as you would green onion and can keep them in a ziploc in the frig for a long time.